The issue is not an argument about philosophy in any way. It’s really quite rudimentary. The public sees large human bones that represent a question science cannot and will not answer, so they speculate to ponder their own answer. Powell’s tactic to elevate the “objective” philosophers over the “subjective” philosophers is to redirect the case into a confusing textual sermon on his own secular and evolutionary worldview. Wouldn’t it JUST. BE. EASIER. at this point to bring out the bones and talk frankly about what evolution actually does say on the matter? If evolution is such a pet of Powell’s, why won’t he let evolution address it? So ancient mythology, when entertained, begets a modernized version of the same primitive mythology. Agreed. To suggest this never-ending and complicated trail of discussion is vain and fruitless would be true if it weren’t for the fact that we’re still left with giant bones that nobody will answer for. Again, “giants upon the earth” is no longer purely “mythology” if we have giant bones—and we do. Conspiracy is not a “theory” when there’s proof. Some of the legend or lore surrounding giants might be mythological, but we won’t know what is or isn’t until the bones are addressed, and they can’t be as long as the Powells of the world stand in the way as keeper of the keys to the mounds, canceling out the resources to dive into true science on the grounds that it would only be to prove or disprove irrational conspiracy theorist’s mythological fables. It’s not about mythology, and it’s not about philosophy. It’s about bones in the ground. Powell refuses to appreciate this simplicity as long as his complicated lectures about largely unrelated subjects continue to herd people away from further investigation. Through his posh and indirectly belittling double-speak report, Powell gained the support of Charles Doolittle Walcott, the chief executive officer of the Smithsonian, shortly after Powell’s death. Walcott hailed the report with such irrefutable and mesmeric magnitude that the Smithsonian executives deemed the document the “Powell Doctrine.” Powell’s smarter-than-you linguistic skills naturally fed the pride of many of his followers, which by extension lent itself to further brainwashing from the top rung of the Smithsonian and down. From 1907 to this day, the now-outdated Powell Doctrine has been the final word on the issue of giant bones, as well as ancient Indian culture. Powell was, himself, viewed as a great authority, but he was only one man. When Walcott rallied the rest of the Smithsonian superiors to embrace the Powell report, the rest of the world embraced it as well, because “they” said it was valid. As a result, then, the museum established the Powell Doctrine as a literal, official policy to exclude any and all alternative evaluations of the mounds, bones, pictographs, and human-origin hypotheses, regardless of evidence. Any perspective, no matter how scientifically sound, would be snuffed out under the suppressive abort button of the doctrine. After 1907, it would not matter what was found in the ground. The policy was solid. No opinion other than Powell’s would ever matter to the Smithsonian again. And you can guess what naturally happens next: Under this administration, years of the institution’s time and money are placed into book collections, exhibits, staff training, and uncountable materials that support this doctrine as truth. The fortress built cannot easily be torn down, and its influence spreads. Tragically, because of the weight the Smithsonian’s opinion holds to educational institutions across the United States, the Powell Doctrine policy of exclusion was also incorporated into the dogma of most major American universities, adding a behemoth layer of clout to Powell’s appraisal. Students of reputable colleges all across the country haven’t the slightest idea why they are being taught what they are, or that it all came from one man 150 years ago. Much documentation has been collected that follows an unscrupulous trajectory from various archaeological digs to the Smithsonian as research teams are submitting their finds to the museum for study and/or display, and the trail goes dark at that point. The bones the Smithsonian is receiving are not making their way to the museum floor or laboratories, and nary is a word uttered that they were ever submitted after they were unearthed. Those who contribute the bones to the museum do so in naïve trust that the Smithsonian will appeal to the government for grants and additional research funds, but because of the policy, the buck stops there, and that in turn affects the budget allowance for universities to follow up with any kind of field study for tomorrow’s generation of scientists. Despite this, well before Powell’s document, the world was aware of bizarre discoveries. Not limited to bones, this also included the strange astronomical and astrological building patterns surrounding ancient structures and monolithic edifices such as those in Baalbek, as well as enormous tools, strange drawings, and prevailing legend of primitive cultures all around the globe. The Smithsonian was not always involved in every discovery reported, which is why the public does not have to search far and wide into the archives of obscurity or conspiracy to be showered with visual evidence that something walked the earth in the old days we can’t explain away. And not every personality within the institution-of-the-final-word appreciated the deliberate blind eye. In 1996, an enormous underwater structure was found in the offshore of Yonaguni in Okinawa Japan. The 5,000 years old structures include the ruins of a castle, a triumphal arch, five temples, a sphinx and at least one large stadium, all of which are connected by roads and water channels and are partly shielded by what could be huge retaining walls. After in-depth research conducted by experts, it has been proven that there is a vast amount of evidence of man’s influence on the massive structures, even it could have been made by giants who ruled the world before us. 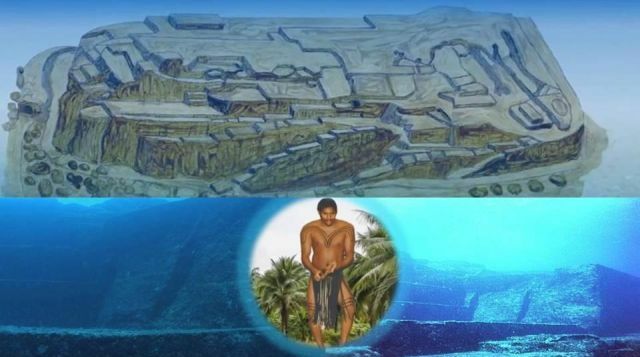 The legend of the giants in Yonaguni Island tells us that giants from a giant city across the sea often visited the Kavalan people of Yilan, who used the strength of these giants to help them build any kind of construction in exchange for food. However this way of helping each other was totally crushed after a huge seismic event took place a hundred years later and the giant city, most of it apparently sank below the sea. The first photo is of a 45 foot skeleton which is mentioned in the chapter on GIANTS in my new book "Out of the Bottomless pit" We think a 9 foot giant must have been big, but a 45 feet high giant must have been downright scary! Reconstruction of the Giant Skeleton found in Loja in Ecuador 19 October 2012. Filed under: Anomalies (Source: Global 333) in the province of Loja, in the South of the Ecuador and the Peru border, residents remember hearing long ago in the beautiful valleys in this province were reportedly discovered skeletons very similar to those of humans, but of an incredible size. Is this photo proof of the Nephilim?